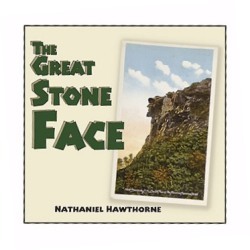 The Great Stone Face, by Nathaniel Hawthorne, updated by PJ Saine, 2004. A new edition of Hawthorne's classic tale, illustrated in color with vintage New Hampshire postcards, including 14 different views of the Old Man of the Mountain. Hardcover, 44 pp., 8 1/4" x 8 1/4".